This delicious recipe comes from our 12-year-old homeschooled contributor, Angelica. Pecan pie is king at our home on Thanksgiving. My dad, momo (grandmother), aunts’, uncle and mom are obsessed with pecan pie. We make a few, buy a few, and the family is sure to show up at our door with a few. My mom’s in charge of Thanksgiving, she works her magic on the food and I’m given reins on the sweets. So this year we’re mixing it up a bit, cause I’m in charge and this girl wants pumpkin bars. 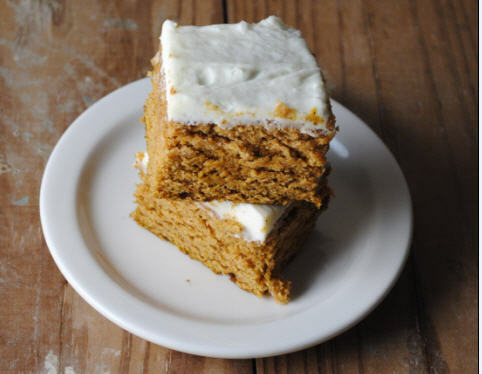 Pumpkin bars piled high with cream cheese frosting and a sprinkle of nutmeg. These bars are easy to make, can feed a crowd, and fit nicely snuggled between all those pecan pies! In a bowl, beat the eggs, pumpkin, oil, and sugar until well blended. Combine the flour, nutmeg, baking powder, baking soda and salt; gradually add to pumpkin mixture and mix well. Pour into an ungreased 15 x 10in baking pan. Beat the cream cheese, confectioners' sugar, butter and vanilla in a small bowl. Add milk 1 tablespoon at a time until desired consistency. Angelica ~ A 12yr old homeschooler with dreams of becoming a pastry chef. Addicted to comics, food network, and carnival rides, Angelica loves taking over her mom's kitchen. She is currently working on perfecting her piecrust while her family reaps the benefits. You can find her sharing her baking skills over at Sweet Life.